Lambeth Cyclists: Calling Dr Bike! 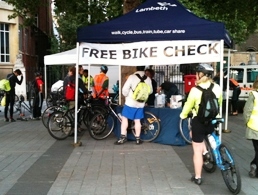 Lambeth Council’s free Dr Bike events return on Wednesday evenings through the summer. Dr Bike will look at your brakes, tyres, gears and the general road-worthiness of your bike. The Dr Bike mechanics will fix any problems if it's possible to do it there and then. Otherwise they will tell you what is wrong so you can take your bike to a bike shop and explain the problem. The police will be at the events marking bikes and adding details to BikeRegister.com. This can deter theft and will ensure that your details are on a nationwide database so if your bike is stolen, it is more likely to be returned to you. 24 May – Waterloo, outside James Maxwell Clerk Building, opposite Imax. 28 June – Waterloo, outside James Maxwell Clerk Building, opposite Imax. More details about these and more Dr Bike events on Lambeth Council's website.